I remember living for the summer with Mama Lopez those doors opened up to me Mama Lopez was always so very nice and staying with her was one of the best memories and when I saw this picture so much wonderful memories came floating up and remembering was sweet. This picture is taken from in front of Wesley Church, which would be on the left and Wesley Primary School would be to the right, looking toward swing bridge. The left edge building is Harvey Hall and then there is Dean Street and the yellow building was Little Store. Lopez Drug Store was on the right opposite Little store at the other corner of Dean Street and Albert Street - Bet this was the late 60's. 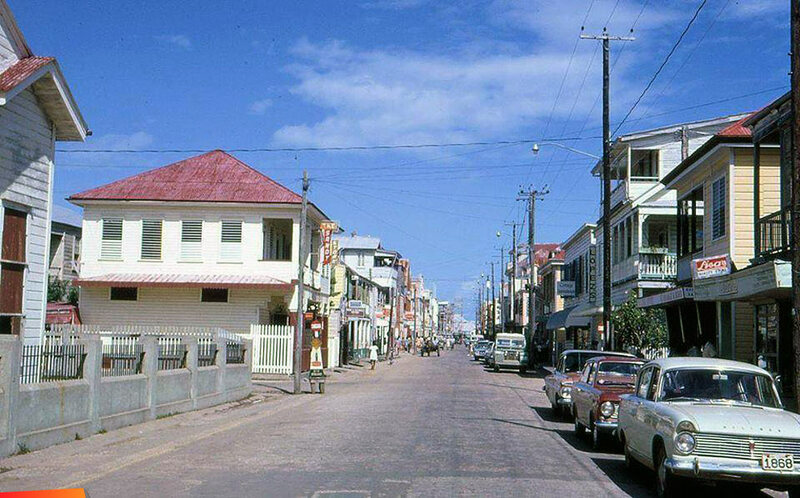 The white fence was NOT there at Little Store in the 50's and Belize City had very few cars in the 50's. Used to be my hang-out at nights after sun-down. Albert street looks very wide. Check the cars - all 50's/60's vintages. See the Chevvy, third car. Transportation was mostly bicycle in Belize City in the 50's. This must have been taken on a Sunday afternoon, because there are virtually no people. Allow me to correct somethings.the store opposite lopez was sandys operated by Thomas Valencia family to the ice cream people. Further down the street 3 storey bldg was where I first established Maya's Electronics in 1967. opposite Chevannes bottling works. TV came to Belize in 1984. The building TV 7 was only used as a reference as that is the office that is there now.